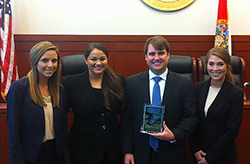 From Oct. 2-5, 2014, Cumberland School of Law students participated in the first trial tournament of the 2014-15 academic year at the University of Florida, Gainesville, Fla. The third-year students team of Kendall A. Lee, Paige A. Duncan, John R. Spade and Spenser H. Templeton started this year right where last year’s teams ended with much success during the 2013-14 academic year. The team was coached by alumna Allison Taylor of the Class of 2003. The team had less than three weeks to prepare the competition’s problem. They won all ballots except one through the preliminary rounds. They faced Barry University in the quarter final round and swept all ballots. During the semi-final round, they competed against Florida Coastal and lost by a split ballot. Other schools at the competition were The University of Alabama School of Law, Faulkner University Jones School of Law, Fordham University School of Law, The University of Florida Levin College of Law, The University of Georgia School of Law, The University of Akron School of Law, The University of Denver Sturm College of Law, Mississippi College School of Law, Florida State University College of Law, Barry University College of Law, and Florida Coastal School of Law.